David Kamen was on a tour of Manhattan’s Per Se restaurant several years ago when something unexpected happened. Thomas Keller, its famous chef-owner, walked in the room. 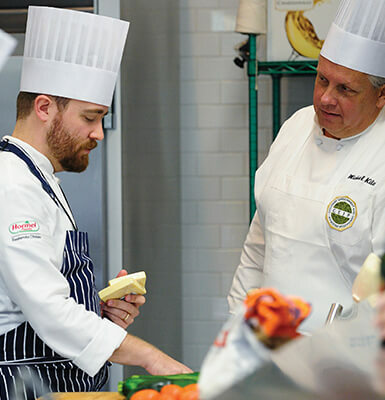 CEIP – the brainchild of Hormel Foods and the consulting arm of the highly regarded Culinary Institute of America (CIA) – began nearly a decade ago. “Hormel Foods wanted to demonstrate our commitment to the foodservice industry,” said Annemarie Vaupel, the innovation team leader for the Foodservice division of Hormel Foods. CEIP is a place for chefs already skilled in their craft to come together to advance their learning, share ideas and work on common problems, she said. CEIP is advertised in trade journals and online, and Hormel Foods sales professionals often inform their customers about the opportunity, Vaupel said. However, the company doesn’t manage or influence the selection process. Vaupel is happy to entrust that task to the CIA and even more so, to work closely with Kamen to “develop content and keep it as relevant as possible.” Labor shortages, health and wellness, and workplace stress are examples of recently added topics. 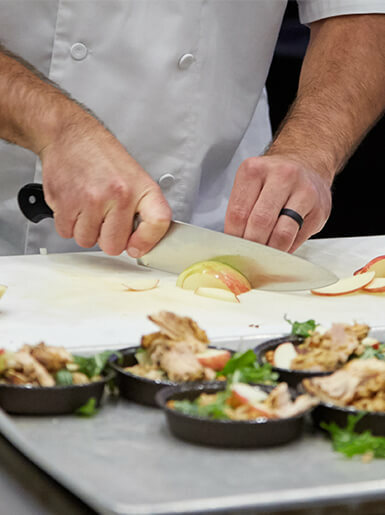 During the 18-month program, approximately 15 chefs work virtually and convene three times, once at each of the CIA’s American campuses: Napa Valley, Calif.; San Antonio, Texas; and Hyde Park, N.Y. 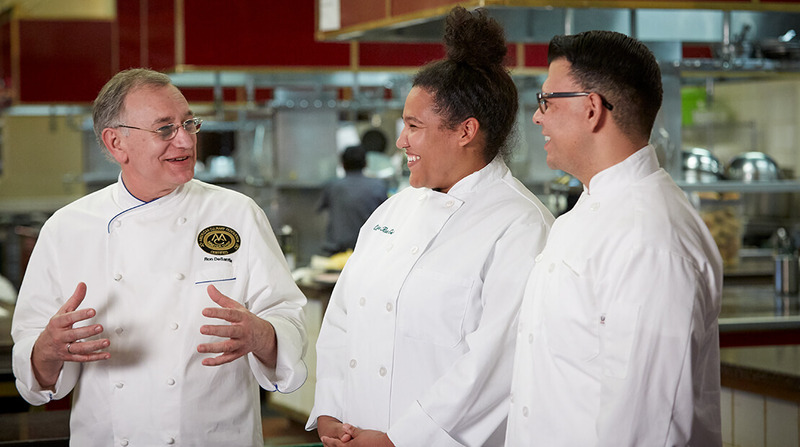 While each session has bragging rights, the New York meeting boasts the leadership module, complete with a field trip to some of New York City’s most sought-after restaurants: Per Se, Daniel and Red Rooster, for example. All Hormel Foods asks in return is that CEIP graduates participate in the company’s Circle of Innovation. With approximately 30 active members, the circle is a place for Hormel Foods to get feedback and insight on potential products. 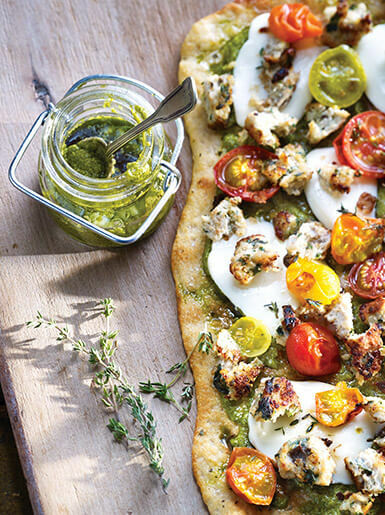 Sometimes new items are tested in the kitchens of Circle of Innovation chefs, Vaupel said. 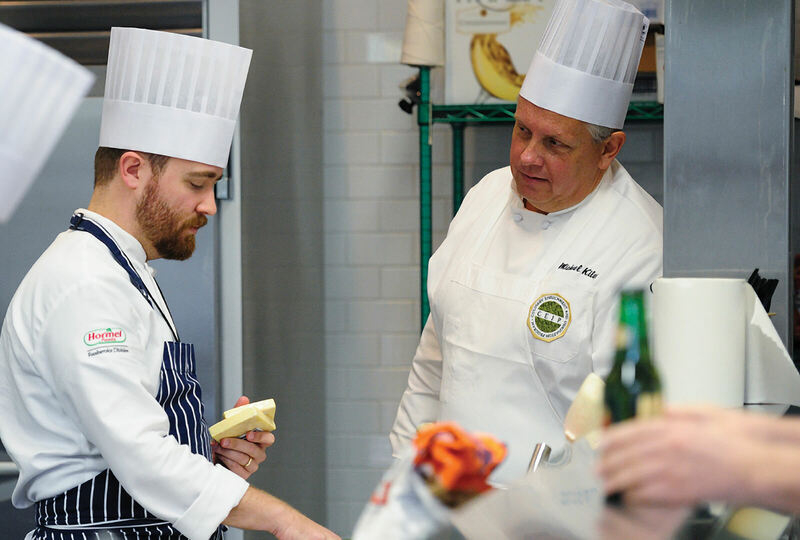 Certified Master Chef Ron DeSantis speaks with students at the Culinary Institute of America. Ron DeSantis, one of America’s few certified master chefs, helped author CEIP when he was part of the CIA’s consulting practice. It was the springboard to his long-standing relationship with Hormel Foods, and to this day, it remains near the top of what must surely be a long list of proud accomplishments. “It was one of the most exciting things I’ve ever worked on,” he said. The bloom isn’t off the rose by any stretch of the imagination. “One of the best parts [of the program] is that chefs from all parts of the industry come together as peers and share their stories. It’s great to learn what’s the same and what’s different,” Kamen said.